If you use the multi-desktop Spaces feature of Mission Control often, you’ll probably like a hidden gesture in Mac OS X that lets you immediately jump back to the most recently used Space with just a four-fingered tap on the trackpad (or Magic Mouse). Here’s how to enable the gesture with a defaults write command. Go to a different desktop and perform a four-fingered tap to immediately switch back to the previously used Space. You’ll obviously need to have multiple Spaces open for this to work, and once you get used to it, it’s a very nice addition to the other Mac gestures. This is a tip found on CultofMac written by Keir Thomas, who recently wrote some cool posts for us and also authored the book Mac Kung Fu . Thanks for sending this in Torsten! BTW it is a four finger double tap not just a tap. 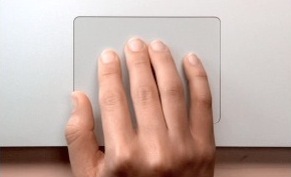 It’s only a two-finger, double tap with the Magic Mouse. NOTE: Apparently, the number of fingers required for this depends on how you have Mission Control setup: If you invoke MC by swiping 4 fingers up, you need to double-tap with 4 fingers, but if you use 3 fingers to invoke it, you double-tap with 3 fingers. I find this is a double tap, not a single tap as the article seemed to convey. None the less, this is an awesome tip, and hope it sticks around for a while. After a little testing, I think I’ve sorted this out. It does appear to be a three-finger double-tap. However, if you have “Look Up” turned on, this won’t work at all. A small price to pay, I think. Having the “Mission Control” gesture turned on or off didn’t seem to change this gesture for me. It was a three-finger double-tap either way. I did find a sort of interesting bug with this gesture. If you’re in Mission Control and use this gesture to switch to a different space, the application icons that you see at the bottom of the windows in Mission Control remain on the desktop of the other space without the windows there. I discovered this very much by accident, as I suddenly had a floating Safari and Pandora icon on my desktop. Doing the Mission Control gesture corrects it, but it is peculiar. For the record, I’m running 10.8.1.